The aim of the meeting is to give everyone the opportunity to share, in small groups, what we know about where we live and plot the places where people live (or have lived) on a map of Lewes. If you have documents, for example old deeds or photographs, please bring them along. Even if you don’t live in Lewes now, or never have done, please come to the meeting. The questions you could ask and your contributions to the discussions will still be valuable. Perhaps you could tell everyone something about why you live in Lewes and the history of the places where you have lived, both past and present. How old is the house you live in now, or any previous house: 21st century? 1970 -2000? 1945 -1969? Inter-war? Edwardian? Victorian? Georgian? Earlier? How long have you, or your family lived there? Is your home the first to be built on that site? Following the meeting a small team will gather together all that we have learnt and write a short piece for the Bulletin and the Web site. We are hoping that the information we collect will be a very useful source for the group and might lead to some new group projects. Bob Cairns will be giving a talk entitled “Industrial Archaeology of Lewes” to the Sussex Industrial Archaeology Society (SIAS) at 7.30 p.m. on Saturday 11th February 2012. Bob’s talk will be illustrated using images from his extensive collection of Lewes postcards. The SIAS look forward to having Lewes History Group members join them for this event. There is a small entrance fee of £1 for non-SIAS Members. 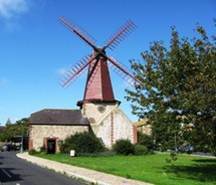 The SIAS meeting is at West Blatchington Mill Barn, Holmes Avenue, Hove, which is in itself well worth a visit – a remarkable windmill that appears to arise from the roof of a large barn, visible fom the A27. The mill was built in about 1820 on a tall flint and brick tower that is surrounded by barns. It was beautifully illustrated by the artist John Constable in a watercolour dated 5th November 1825. The mill is a smock mill. These are usually octagonal, but West Blatchington mill is six sided – one of several design features that are very unusual. If travelling by car, take the Dyke Road exit from the A27. 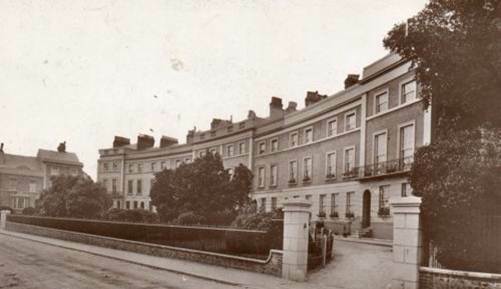 This 1913 postcard of Priory Crescent, Southover, was recently offered for sale on eBay. The Regency-style crescent was built starting in 1835 on part of the cemetery of Lewes Priory, and was originally called New Crescent. Behind an elegant and symmetrical facade, each new owner created their own house to their own design, and from the rear you can appreciate their different ideas.There are 10 houses altogether in the yellow-brick and stucco crescent, with its elaborate pilasters, ballustrades, balconies and parapets. Priory Crescent has a grade II listing from English Heritage. 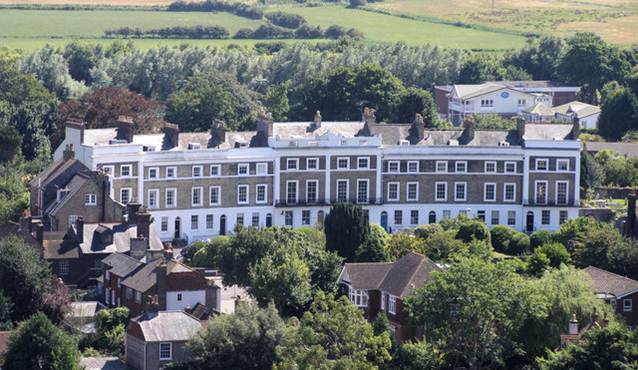 After the Catholic Emancipation Act allowed Catholics to worship openly again, a Lewes group began to celebrate Mass at 10 Priory Crescent, overlooking the ruins of the former Priory of St Pancras. Later in the 19th century Lewes Catholics built their own Church on St Anne’s Hill, dedicating it to St Pancras. The view below was taken from Lewes Castle. This run of records continues until the implementation of the new Planning Act in 1948. The architect and/or builder’s names are often included, along with the owner. Source: ESRO/dla25/DL/A/25. The full catalogue is available online at the Access to Archives website. At a special meeting held 8 Aug 1883 the Lewes Borough Council, led by the mayor Walter Crosskey, ordered that the corporate seal should be affixed to the agreement with Mr William John Smith for the purchase of the Star Hotel, Corn Exchange, Stables and Tap. The council also approved making an application to the Treasury for their approval for the council borrowing the sum of £6,900, at interest, on the security of the land and property purchased from Mr William John Smith (except for the Star Tap, the resale of which was anticipated) or of the Borough Fund or the Borough Rate. They proposed to repay the loan over 30 years. The Borough Council’s intention, based on the recommendations of a committee chaired by Wynne E. Baxter and including Walter F. Crosskey, James Adames, John Every, Joseph King, Isaac Funnell, Benjamin Thorpe, Henry Pumphrey and Frederick Flint, was that the Star Inn should become the new Town Hall for the Borough. The Borough Surveyor gave a detailed report, noting that the front wall was up to two inches out of plumb, but that as they were 2 feet 6 inches thick this was not of great importance. The cellars were damp and the Corn Exchange needed repairs, but the central location was excellent. Over £1,500 was needed for the repairs and alterations. The same meeting also agreed with the owners of land adjoining Pelham Terrace and Talbot Terrace for laying a new sewer for the St Johns Farm Estate. Source: Verena Smith (ed) ‘The Town Book of Lewes, 1837-1901’, Sussex Record Society, vol.70 (1976). 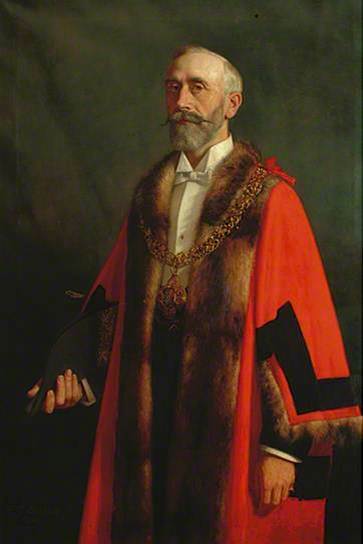 Wynne E. Baxter Esq. Alderman J. Holman, J.P.
Oil paintings by unknown artists, both in the Lewes Town Council collection. As noted above, Wynne E. Baxter was the first mayor of Lewes in 1881-2, but dead by 1883. 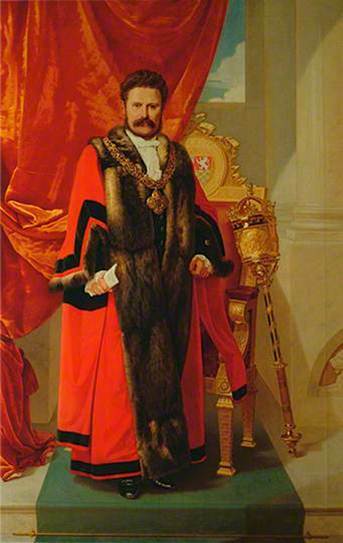 Alderman Holman was one of his early 20th century successors, and is pictured above wearing the same regalia. This entry was posted in Art & Architectural History, Economic History, Lewes, Local History, Political History, Urban Studies. Bookmark the permalink.